Still author has vices that contradict "standard male operating procedure"
(The Frisky) -- Men don't have "guilty pleasures." We own, nay, celebrate what's bad for us. Our obsessions are points of pride, not shame. 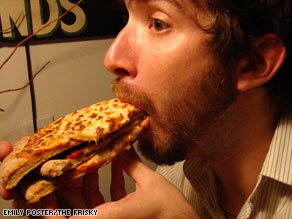 Some men feel no shame in gobbling three slices of pizza at once if they want to. You'll never see a guy wolf down a small mountain of waffles with a side of bacon and squeal, "Oh my gosh, I can't believe I ate everything! I'm so ashamed." We will shamelessly sit in a nest of pizza crusts playing video games for endless hours. Unabashed tears will crawl out of the corners of eyes when the hometown team chokes at the last minute. Beer will be quaffed, their caloric potency mocked. These are the things that make life worth living. Feeling bad about feeling good, even if the good is short-term, is for puritan chumps. If I could, I'd go out everywhere in my sweat pants. Of course, overindulging has its prices. Sloth and gluttony are venial sins for a reason. But the whole idea of "guilty pleasures" is something that is lady-specific. Women feel shame over even tiny little hedonistic infractions. I dated a woman once who was very much my type -- hot nerd -- who was deeply embarrassed over her celebrity trash magazine addiction. She actually tried to hide her US Weekly's from prying, judgmental eyes. Eventually, I staged an intervention that went a little like this: "Please, woman, own your love of snickering over pictures of Hollywood stretch marks!" This is not to say men aren't susceptible to social pressures, and masculine stereotypes. There are things that, while not "guilty pleasures," are ... minor vices. Things we are into that contradict standard male operating procedure. After all, one cannot live on bacon and beer alone. But a lot of guys find themselves infatuated with hobbies, media, and creature comforts that don't really fit the lumberjack mold. I'll wager many ladies are the quiet guardians of their man's not-really-secret, but not-really-public, quirks. I am not ashamed of anything. This is why I will admit to the following minor vices, and in the process, teach women that they can be loud and proud when it comes to the hours spent rehearsing pucker faces in front of the mirror. Boldly rock your "guilty pleasures." Anyone got a problem with that? I love bath salts, bubbles, fizzy stuff that promises to magically transform your bathtub into a sauna. The whole kit and caboodle. There is nothing I love more than a good, frou-frou soak. Heck, maybe I'll light a votive candle too. I ate it this past weekend, in fact. That's right. I shoveled French egg pie into my mouth. Yes, quiche, a food that sounds like an inappropriate bodily sound. It was delicious. It had spinach in it, and I washed it down with sparkling water. Sure, I could have eaten something drenched in cheese, or deep-fried. But the moment called for something sensible, delicate, and... flaky, okay? Quiche is awesome. A recent minor vice has actually entered my life. Every Tuesday, I eat Chinese food and watch "The Real Housewives of New York." Have you seen this show? It's like an open invitation to hate on women. Is this really popular female wish fulfillment? All that chattering, and glittering? They are a bunch of bedazzled banshees that suddenly make me understand why the French guillotined all the rich aristocrats! Sigh. While I'm not overly susceptible to gender norms, I think I need to go to the comic book store, or hit the shooting range. Oh, forget it. See you next week, my beloved "Real Housewives."